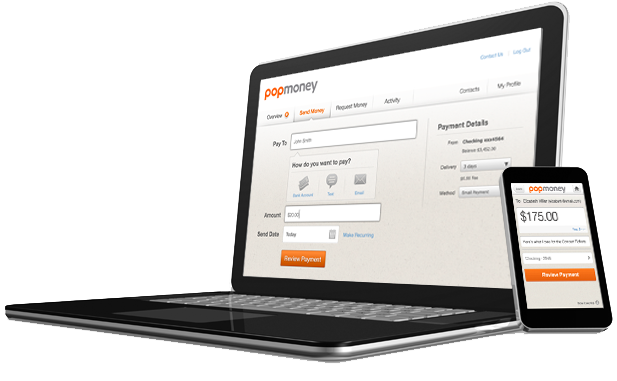 Popmoney is a Person-to-Person payment service available through Online Bill Pay & GF Mobile. You can use Popmoney to pay anyone you know, or owe in the United States. Popmoney is the safe and easy way to send and receive money directly from your Greenville Federal account – it’s safe and secure and all you need is an email address or mobile phone number. Popmoney Person-to-Person payment service lets you send money for birthday gifts, graduation, pay your rent, or send money to your kids away at college. The request money feature lets you organize payments for any group activity, receive membership dues, or accept donations. You only need to know a persons name and email address, or their name and mobile number to send or request money. From the moment information is sent to Popmoney to the time it is stored and accessed again, it is encrypted using industry leading software, hardware and algorithms. Security is also utilized at specific points and actions in the product. For example, to help prevent an unauthorized person from fraudulently depositing someone else’s payment, one-time passcodes are used. For every initial payment to a new email address or mobile phone number, a one-time passcode is sent to the user. The user must provide that passcode back to Popmoney to verify his “ownership” of that mobile number or email address before he can deposit the payment. How fast can I send and receive money?